OneCast hiccups a bit if you try to stream through a normal Wi-Fi connection, but it's almost like playing an Xbox directly with a good land connection. Mac gaming is no longer in quite the sorry shape it was in the days before Apple started using Intel chips, but game developers clearly still think of it as an afterthought. Truth is, if you really want to play the best new PC games on a Mac, it’s often better just to partition a bit of your hard drive for Windows (through a virtual machine like Parallels) or to stream games from another system. Waiting for a Mac port is like waiting for George R.R. Martin to finish A Song of Ice and Fire. As we shared last year, few streaming apps pull this off quite so neatly as Nvidia’s GeForce Now, as the service hosts entire PC games you own on Nvidia’s servers and you simply stream them to your Mac if you have a strong internet connection. You don’t need ridiculously priced GPUs, and you don’t even need a proper PC. Unfortunately, it’s still locked behind a public beta that remains tough to get into. If you have an Xbox One, though, you’ve now got a decent alternative for streaming games to your Mac in the form of the new OneCast app. For just $10 (regular price $20) and a decent internet connection, you can stream any game from your Xbox One straight to your Mac. I’ve spent a bit of time with it, and while it’s rough in spots, it generally works better than it probably has any right to. Alas, here’s the (potentially) bad news. OneCast is a reverse engineer of Microsoft’s own service for Windows PCs, which allows Xbox users to stream their games to a nearby PC through the Xbox app. The idea for Windows users is not so much to let you play Xbox One games on an operating system that developers shun, but to play your Xbox games on a laptop or PC when someone else is hogging the TV to watch Westworld. 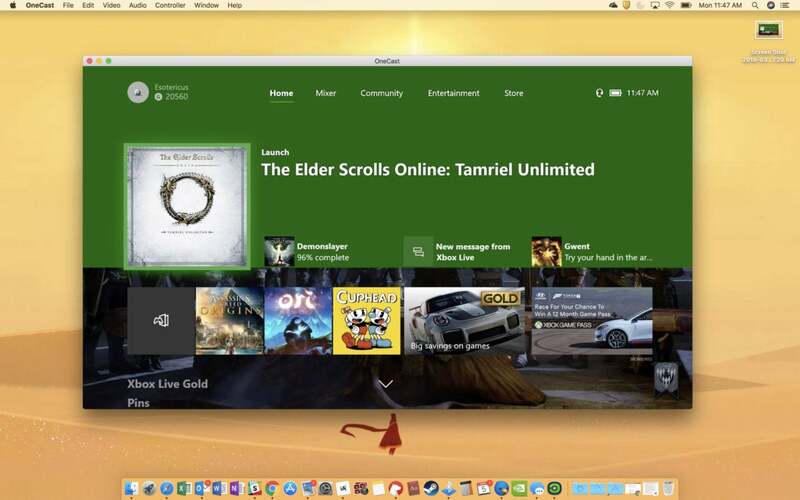 With OneCast, Mac owners have that same privilege, and it also allows you to play Xbox One games on your MacBook in a more comfortable spot. But there’s no evidence that Microsoft approves of any of this, which means OneCast could vanish tomorrow or a couple of weeks from now if the developers get slapped with a cease-and-desist. That’d be a jerk move, though, especially since OneCast proves this kind of technology can be ported to the Mac fairly easily and with a high degree of quality. For now, though, let’s have fun. You can tell the makers of OneCast have an affection for Apple’s philosophy since it’s remarkably easy to set up. In essence, getting it to run requires little more than downloading the app, installing it, making sure your Xbox One and Mac are on the same network, signing into Xbox Live through your Mac, and jumping into streaming. That’s about it. On our network here at Macworld, I had a bit of trouble in that I had to manually had to enter my Xbox’s IP address into a prompt, but even with that extra step setup only took around five minutes. You can even add multiple Xbox Live profiles if you wish. The one mishap was that OneCast couldn’t find the Xbox on our network. 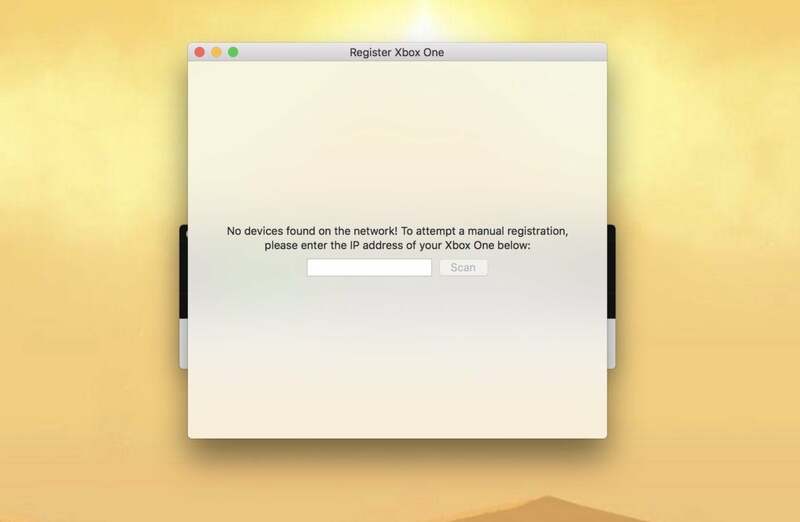 We simply plugged in the Xbox’s IP address (found through the Xbox’s settings), and it worked fine. OneCast also comes with a generous 14-day trial that lets you use the app as much as you want, after which you pay a currently discounted licensing fee of $9.99. On April 1, though, that’s going to jump up to 20 bucks. When I tried streaming with the land connection here in the office (which runs around 700 MBps during work hours), the transition was basically lossless aside from a couple of hiccups. In fact, we sometimes noticed that action would sometimes seem to happen on the Mac’s stream before it would happen on the TV that was directly connected to the Xbox One. Wi-Fi was a different story. One of our Wi-Fi channels here downloads at around 15 MBps, which I figured was a reasonable speed for representing an ordinary connection at home. It performed well enough on OnceCast’s “High” settings, but it took a couple of minutes to get going. Once it did get going, though, it performed well enough that I was usually confident attributing my many deaths in the ultra-punishing platformer Cuphead to my own ineptitude rather than a subpar connection. Even so, the experience wasn’t ideal, and I certainly wouldn’t recommend attempting to play competitive multiplayer games with the kind of performance I saw with the download speeds we were getting through our regular Wi-Fi connection. I’m not really sure what kinds of framerates I was getting since it’s a bit of a hassle to get a framerate counter running on a Mac these days, but I’d say it was struggling to reach 30fps on Wi-Fi. At least it’s an alternative for those situations when someone’s hogging the TV or you’d like to play your Xbox games on your iMac or MacBook away from the usual spot. 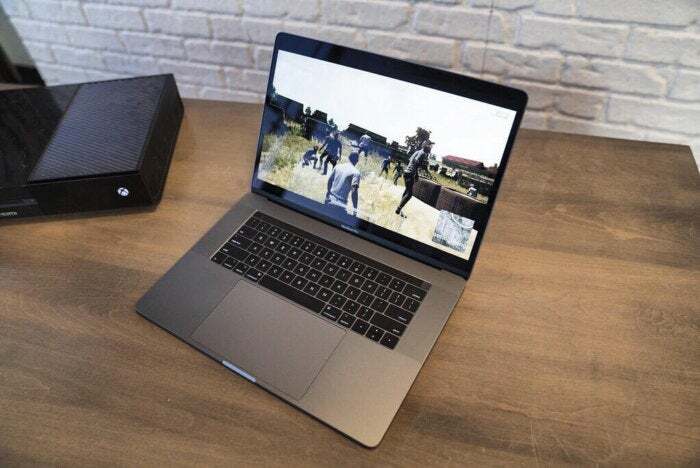 PlayerUnknown's Battlegrounds streaming to a MacBook Pro. Also, a bit of a warning: I was streaming from my first-generation Xbox One. I haven’t had a chance to see how well OneCast performs with the more powerful Xbox One S and Xbox One X consoles, but word from the rest of the internet suggests that the performance remains based on the strength of your internet connection more than anything else. OneCast works so well that it serves as a reminder that developers can often rather easily release their products for Macs if they set their minds to it. In Microsoft’s case, the company isn’t really even losing money: You still need to have an Xbox One to use the service, so Satya Nadella and friends are still getting that sweet pile of cash from some Mac owners anyway. The worst-case scenario is that Microsoft shuts the whole thing down, although there’s a chance the app itself will continue to work for a while after the site gets shuttered. As for the best case? For our pocketbooks, at least, it’s that Microsoft lets OneCast chug along without interference. Ideally, though, Microsoft itself could extend support for its Xbox One streaming service to Macs, rendering the whole issue moot. If someone got the streaming service to work “simply” by reverse engineering it, imagine how much more efficient it could with Microsoft’s own team on the project. We like our Macs, Microsoft, but we also like the games you have on your system. Let it be or make your own version. We’ve already shown we’ll embrace it.